Simply magnificent hat-trick Harry Kane! It was another epic night for Spurs' front man Harry Kane who hit a "perfect" hat-trick (left foot, right foot, header) to defeat APOEL 3-0, putting Spurs level top of Group H with 6 points from their two games. This was Harry's 34th competitive goal for Spurs this calendar year, and his sixth hat-trick in that time, making it 9 career hat-tricks so far. One of the great things about Harry's continuing achievements is that it is "the story so far". Harry is the first person to seek ongoing development, and who is to say what he cannot achieve? Those goals tonight were Spurs' first three shots on target. Such is the lethal effect of our number ten. APOEL have a very good home record in European competition, and had some dangerous moments with one shot hitting the bar, and Hugo Lloris having to make two particularly good second half saves. Spurs were somewhat decimated by injuries, with playmaker Eriksen not travelling due to illness, and Dembele joining the ranks of the injured Lamela, Rose and Wanyama. Dele Alli and Jan Vertonghen were suspended. Vertonghen has completed his one-match ban, but Dele will have to sit out the trip to Madrid next month. Pochettino adapted by playing Kieran Trippier at left wing-back, and playing Ben Davies at left centre-back, which is a position he has of course played for his country. Harry Winks played next to Dier, and Moussa Sissoko had another good game playing with Son behind Kane. Serge Aurier had a hard time against the fast and effective APOEL left winger Efstathios Aloneftis, who I felt was the best player for the home side. Before kick-off here APOEL remembered Ian Moores, once a Spurs man, who score a hat-trick in our historic 1977 9-0 win over Bristol Rovers. Moores, who died aged only 43, was depicted in a magnificent graphic formed by the home fans behind their goal. Moores is regarded as a legend here, having played for five years in the 80s and scored many goals for the club. 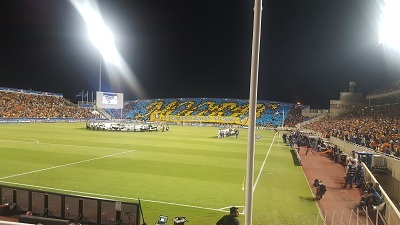 APOEL kicked off and played towards the away fans, but Harry Kane had a chance as early as one minute into the game, hitting a shot wide across the keeper just outside his left post. Son had a shot blocked after a Spurs corner on the right. A useful ball by Davies to Kane led to another chance for Son, which was also blocked. APOEL�s Sallai had a header go wide after Vouros crossed from the right. Harry Winks was having a good game in the middle, hardly putting a foot wrong that I could see. His passing is usually quite powerful and to the feet of his intended recipient. One such ball to Trippier on the left was followed by a cross which was met by a Son header, which went too high and too wide. Igor de Carmargo hit a rasping shot against Lloris's bar after being put in by Aloneftis,who had the beating of Aurier too often. APOEL's runners were finding space behind the Spurs defence and de Carmargo teed up left back Roberto Lago, but the shot was comfortable for Hugo. Aurier crossed for Spurs from the right after a corner. The ball went beyond the APOEL area and was returned by Ben Davies, when Eric Dier headed over. APOEL were awarded a free kick by referee Pavel Kralovec after Davinson Sanchez was deemed to have fouled Aloneftis. Zahid took the kick and Carlao heard wide. Lloris had an embarrassing moment, which thankfully did not turn to disaster when he hit a clearance straight which hit the unprepared Sanchez. Luckily the rebound passed wide for a corner. Following this corner, Spurs took the lead in fine fashion. Toby Alderweireld threaded a nice pass ahead of and to the left of Kane, who opened up his body and placed his left footed shot nicely to the right of goalkeeper Boy Waterman. Spurs were on their way! Very early in the second half, Sissoko fed Kane with a central pass. Kane moved the ball to Son on his left who fired wide across goal. Lloris then made a great save, diving and stretching to his left to cleanly hold Sallai's shot. After a good ball by Dier had given Son a chance on goal, which came to nought, Lloris was in action making another superb save. This time he had to settle for tipping over the shot by Aloneftis, who had found space to wriggle past the Spurs defence. I think it might have been Aurier who was beaten. Aurier was soon replaced by Fernando Llorente, who supported Kane in good style. Spurs switched to a back four with Trippier on the right, and Davies at left back now. Harry's second goal (this one with the right foot) came on 62 minutes and after a fine low pass by Sissoko, perfectly into Harry's path, and perfectly placed past the keeper. Sissoko himself had a shot saved after Kane had acted as his provider, but it wasn't long before the game was over, with Kane's third goal. Kane himself had fed the ball out to Trippier, whose cross was superbly met by Kane's header placed to the keeper's right. One particular local fan to the right of our section had thrown his drink over us after the second goal, and he had a proper sulk on after goal number three. Apart from a word from the home stewards, the offender was allowed to stay, at least until he decided to leave with most of the home fans around him. Kane went off to rapturous applause after 75 minutes, and APOEL's Aloneftis was also replaced, perhaps now being saved for important domestic games ahead. It really was now a case of Spurs managing the remainder of the game, allowing appearances by Nkoudou, and Anthony Georgiou, making his first official appearance for the first team. Georgiou is eligible to play for Cyprus, so this was a very proud moment for him and his family. APOEL now face back to back games against Borussia Dortmund, who lost at home to Real Madrid tonight, and who will be desperate to recoup six points. Spurs will be hoping to get something out of their games against Real, but the first one is a massive task in The Bernabeu on October 17th. I'll be there!